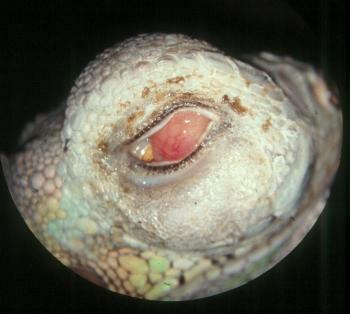 What is happening in this iguana, what could be causing it and how might you treat it? 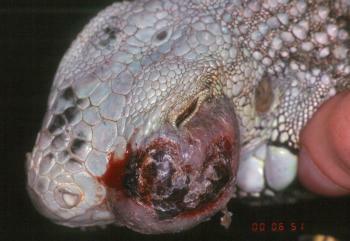 This is a periorbital abscess, as we see here too, but in reptiles abscesses are not filled with fluid pus. Rather, as the inflammatory heterophils do not have the coagulative enzymes of mammalian nutrophils, the lesion tends to be caesous or fibrous in nature. Professor John Cooper has termed these fibricesses (Fibriscess, not abscess, resulting from a localised inflammatory response to infection in reptiles and birds. Vet Rec. 2000 147:515-7.) The main problem around the eye is that such a solid mass distorts the eyelid skin, making reconstruction after resection difficult. This entry was posted in Cases and tagged periorbital abscess, reptile. Bookmark the permalink.